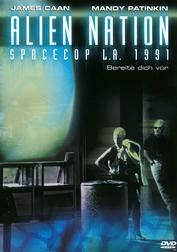 Synopsis: A few years ago a ship containing 250,000 alien slaves landed on Earth and they have no means of getting home. After the quarantine had ended these Newcomers have become part of the population of Los Angeles. And when Sergeant Sykes loses his partner in a liqueur store shooting he gets a new one: Detective Sam "George" Francisco. And Sykes needs him because the murderer of his old partner were "Slags", Newcomers. My Opinion: I always liked the idea of that movie and the TV show that followed. It's not us who go out and space but the aliens come to us and try to live in our society. And I think it's very well portrayed with all the racism and good and bad guys on all sides. The characters may be stereotypes but these stereotypes are not bound to either race and that's what makes it realistic. It's a science fiction movie that basically has no special effects and doesn't need them. 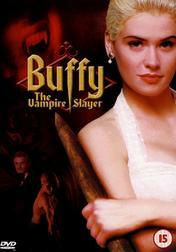 Synopsis: Buffy is a normal highschool freshman and member of the cheerleading squad. But then she meets Merrick and he shows her what she really is: The Chosen One, a Vampire Slayer. Born with the strength and skill to fight the Vampires, to stop the spread of their evil and the swell of their numbers. But she wants to stay a normal girl and wants nothing to do with such rubbish. My Opinion: This movie may not be what Joss Whedon had intended or will do on the TV show. But it definitivly falls into the category of "guilty pleasure" and is a lot of fun if you're willing to accept its cheesiness. And the dialogue is unmistakably Whedon. Also, Lothos used a Samurai Katana, that's a plus in the book. Yeah... it is definitely a guilty pleasure of mine as well. I have watched it countless times over the years. I still prefer the series... but this movie is a lot of fun also. You guys were probably aware of it, but I found it interesting enough to post the clip. OK... What's the deal? Since when has there been a Buffy animated series and why didn't I know about it? There was to be a Buffy animated series, but it never got made. This clip and some character designs were the only things which made it to the light of day. It would have taken place in the High School years. Interesting would have been, how Dawn was during those years. oh ok... damn! here I thought we had something new to watch here. oh well. Synopsis: For centuries Vampires and Lycans (Werewolves) have been fighting and killing one another. Selene is a Death Dealer, a Vampire specialized in the hunting and killing of Lycans. But her latest hunt brought up several mysteries. The Lycans have suddenly guns that can fire bullets containing a light-emmiting liquid - fatal for Vampires. Where did they get those? And why were they following that Human who seems important to them? And Lucien, the ruthless leader of the Lycans, is supposed to be dead for 600 years. But is he actually dead? My Opinion: What I really like about this movie is it's style. The look of the snobbish Vampires versus the more ragged look of the Lycans. The darkness and the rain and the soundtrack. The story and the acting is ok, but not overwhelming. But if one wants to have a nice brain-free evening with a lot of shootings and a bit of mythology in the mix, this is the movie for it. Synopsis: Bruce Banner has been hiding for the last few years. Currently he works in a lemonade factory somewhere in Brazil. But then an accident happens and his pursuers find him again. In the following struggle the Hulk comes out and Banner awakes in Guatemala. He has to find a way to undo this mutation and for this he needs the research data that was recorded during the original accident. But that brings him too close to the love of his life. And two soldiers want to find him at any cost but for different reasons. My Opinion: When I went to the theatre to watch this movie I was a bit uneasy because I didn't like the first movie that much. But I thought that Edward Norton and Liv Tyler would make it at least a decent movie and I enjoyed it very much. The Hulk felt much more real and three-dimensional than the one in the first movie. I was glad that they didn't use the split-screen again but went back to the classical movie approach. The story was predictable - he wanted to lift the curse but ultimately had to embrace his alter ego in order to save the world - but that's what I expect from a (super)hero movie. My Opinion: This was a blind buy for me. Tony Stark's character is very two-dimensional, even after his change of heart. 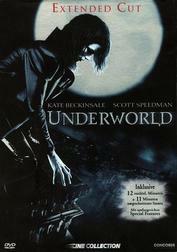 I would put it closer to Underworld than to The Incredible Hulk, more visuals than actual story or profundity. What bothered me, was the fact that they invented a superhero that has no actual superpowers and yet he survives the most absurds stunts as if he had superpowers. First when he crashed into the desert and again when he tested his rocket-boots and crashed without armor into a concrete wall. It may have looked funny but it didn't help with the character's credibility. I find it interesting that movies about a teenager who has been bitten by a spider or about people who are born differently are more serious than a movie about a guy who's inventing the newest weapons. Logic is not a huge concern of this film. Stark does seem to have a lot of bounce... I think the crashes in the suit, though daft, are acceptable as it's the point of the character, but you're right that the crash without the suit is harder to accept. But once you start down that path, a hell of a lot more doesn't make sense. The whole cave sequence was unlikely because they had cameras. Then the sequences of him flying off the the Middle East, and what the hell happened to Rhodes? Roaring off in Tony's car, but not seen again for a while. Actually those last two are covered by deleted scenes. The fact they could delete them at all demonstrates they weren't too bothered about making all the details fit. I forgive a lot though based on what I said in my review about the types of comic story; none of Stan Lee's stuff makes much logical sense, although I felt Stark's character was good (back to the deleted scenes, there was another bit that demonstrated this). And for that matter, I've always complained about Raimi's altered Spider-Man origin because it's ridiculous and far more so than anything here. Better to concentrate on what's in front of you and what I saw was an exceptional cast working with a great script and near flawless effects. 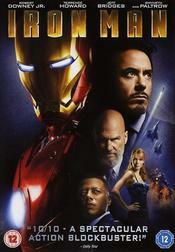 And on that score by the way, much as I enjoy Underworld, Iron Man is better by some considerable margin. 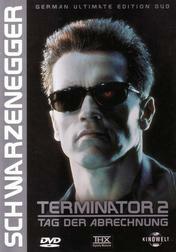 Synopsis: A decade has passed since Kyle Reese was killed and the Terminator was destroyed. But now he's back. Another T-800 was sent back through time. But he's not here to terminate. He's here to protect John from the more advanced Terminator model T-1000 - a shapeshifter. Sarah, John and the T-800 have their hands full with staying alive and preventing the apocalypse. They have to destroy Skynet before it's even made. My Opinion: I had totally forgotten how young John was. I remembered him at least four years older - maybe due to new series. But I still like the movie very much. Robert Patrick is a great adversary with cool morphing effects. And while some of the jokes that John made the T-800 do were a bit childish I liked their interaction. I also liked how the T-800 killed nobody and still had an amazing rounds per minute ratio. For me, it's the best part of the trilogy - let's see how the fourth part will be. Synopsis: Trinity comes into a small town where he meets his brother Bambino again. Bambino is the Sheriff there after he accidentally shot the real Sheriff (i.e. he thought the Sheriff was pursuing him, but he wasn't). Trinity takes the role of the Deputy Sheriff and together they help a group of Mormon settlers who have trouble with a man who wants their land for his horses. 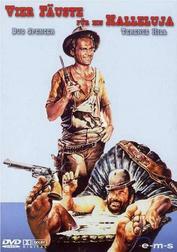 My Opinion: Except for the early movies, Bud Spencer & Terrence Hill movies are always harmless fun. They are childhood favourites of mine and have a certain cult status here in Germany. This is mostly due to a very unique dubbing of these movies but I still enjoy them very much and I own pretty much all of them. Love their movies too when I was young. In fact a regional TV station showed them regulary here, it was always a great fun at 17h00 when the channel runs one (for my brother and me, not really for my mother). I really miss this program (Le cinema de 5 heures) since it showed a lot of fun film and with a really cheap contest at the movie half-time (for the benefit of Sebastien and Eric, the prize were cheaper than the one from Cine Quiz ). My Opinion: I started to watch this right after They Call Me Trinity but had to pause because I had to get up early. So I finished today. My favourite scene was when they ate at that french restaurant and the Maitre D' tried to take away the food or when he tried to flambé the dessert. One of the side effects of that aforementioned dubbing is that the dubbers didn't really care that there was a previous movie and they simply changed the character's name. And often there's even more than one german dubbing and even different german names for the same movie. Sometimes there's a comedy dubbing and a more serious dubbing of the very same movie and sometimes there are two dubbings because East Germany and West Germany made a version of their own. 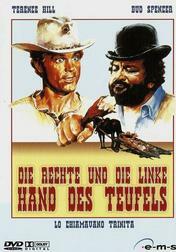 For example: In West Germany this movie is called "Four Fists for a Hallelujah". In East Germany it was called "The Little One and the Tired Joe" which were actually their names in the first movie ("Bambino" is italian for baby or infant).